Boasting a cutting-edge design, the HP Envy 100 e-All-in-One is a reasonably-priced multifunction printer aimed at the tech-savvy homes that requires web connectivity. Its good looks mask its slow speed (comparable to outdated inkjet printers) and mediocre printer and scanner output. The HP Envy 100 e-All-in-One is a fashionable compact machine with a high-resolution touch screen, which is the focal point of the device. One of the products of HP's drive to produce more eco friendly printers, the Envy 100 e-All-in-One is marketed as the earth's first PVC-free printer. HP's revolutionary ePrint technology is integrated in the HP Envy 100 e-All-in-One, so you can access and print using cool apps. 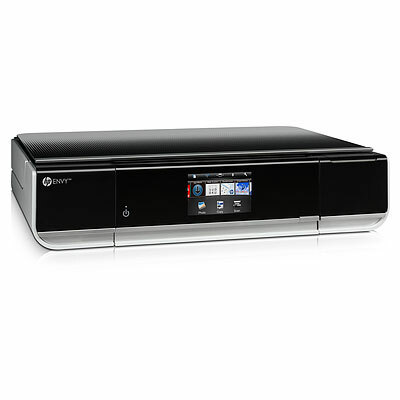 The HP Envy 100 e-All-in-One is Wi-Fi enabled, so you can print directly from any room. The printer is fairly quiet and the paper tray is retractable. The duplexing function is automatic, saving you time and paper. HP could improve the speed of the Envy 100 e-All-in-One, as it only prints 6ppm in monochrome and 4ppm in colour ('best' mode). The print quality of the HP Envy 100 e-All-in-One on images is sub-par.